Dodge Franchise Opens in West LA – It’s Been a Long Time! 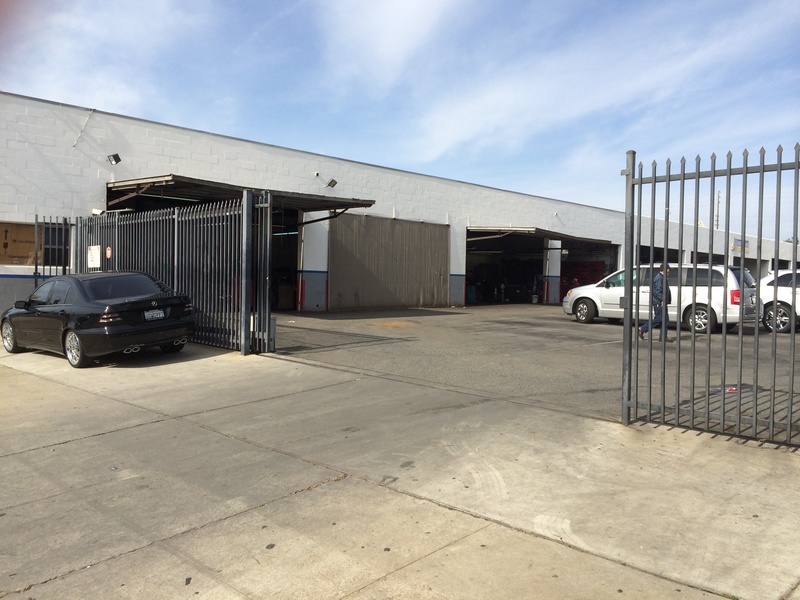 For many years now, the domestic auto manufacturers have had a hard time in Metro Los Angeles. That corridor from Santa Monica to Silver Lake, along Santa Monica, Sunset and Wilshire Boulevards, was particularly underserved by the domestic brands, mostly due to lack of demand but also due to the high cost of real estate. 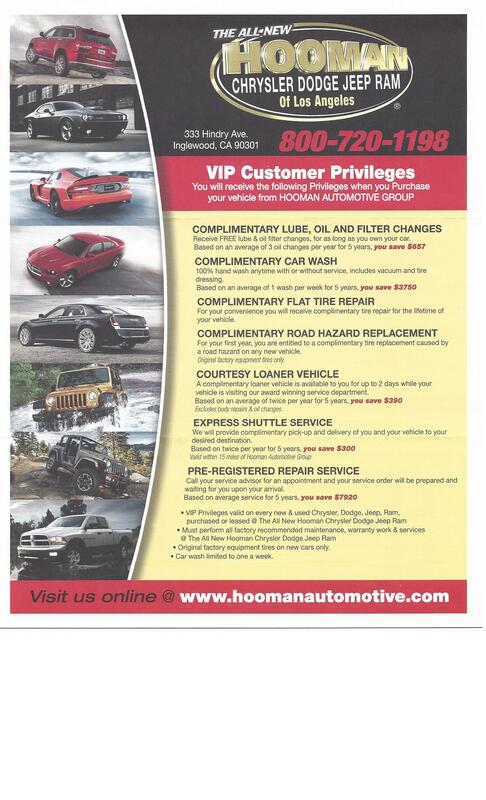 Dealerships on the R.I.P. 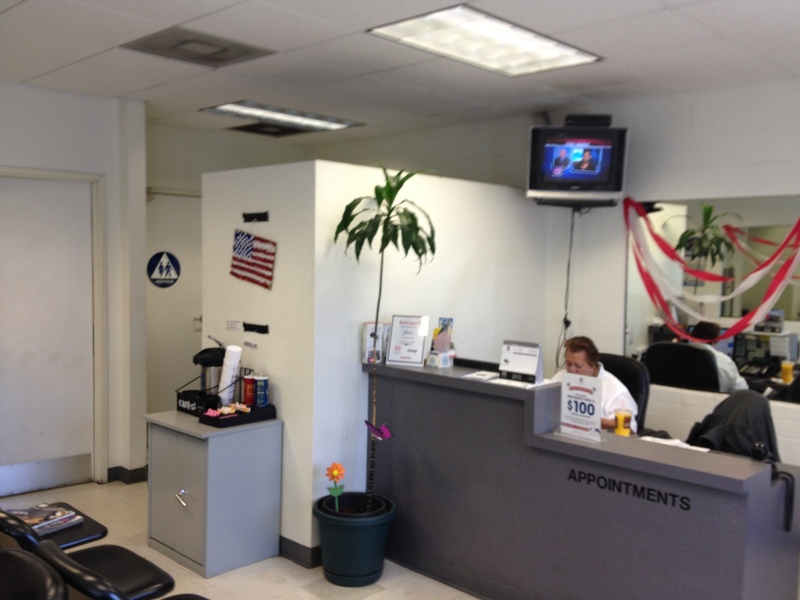 list: Beverly Hills Ford, Hillcrest Cadillac – Beverly Hills, Albertson Chevrolet – Culver City, La Brea Chevrolet – Los Angeles, La Brea Chrysler-Jeep – Los Angeles, Lou Ehler’s Cadillac – Mid-Wilshire, Los Feliz Ford – East Hollywood-SilverLake-Los Feliz. There never was a Dodge dealer in the LA Metro Corridor (at least not in recent memory). 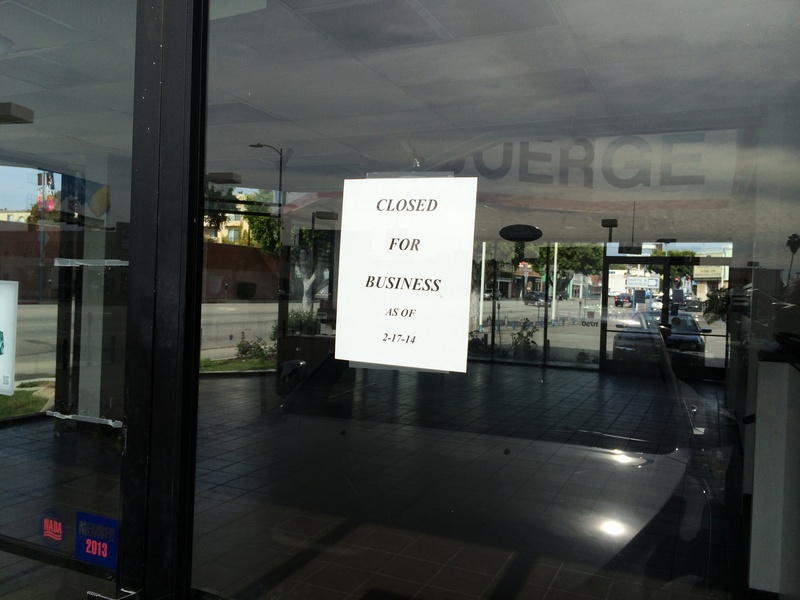 When the Great Recession hit and domestics shrunk their dealer franchises, several dealerships in the San Fernando Valley closed, including Big Valley Dodge in Van Nuys. 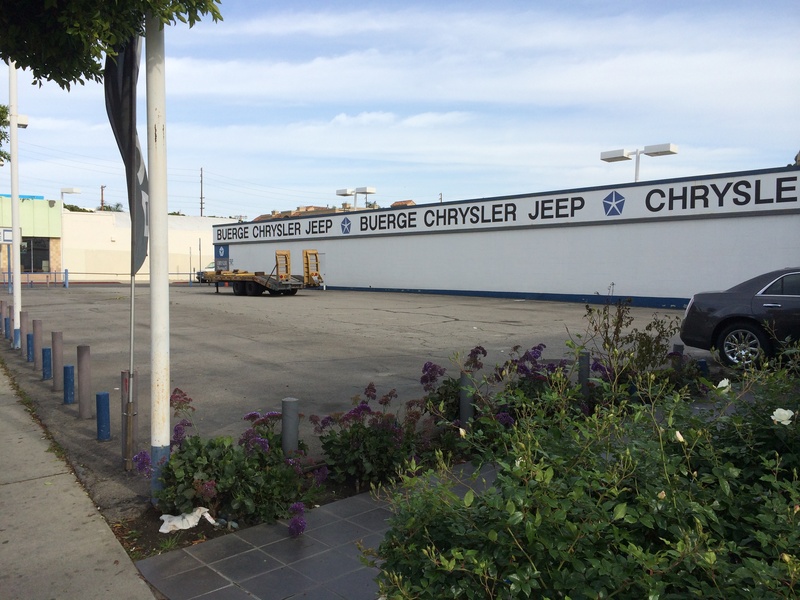 I always thought Chrysler would keep at least ONE Dodge dealership west of Downtown LA, but when Big Valley closed, the closest dealer for most customers in Metro LA was Glendale Dodge (which now includes the Chrysler and Jeep brands). At the beginning of this year, Chrysler opened a company-owned multi-brand [Chrysler, Dodge, Ram, Jeep and Fiat] flagship store called Motor Village LA. It was also the location of the first Fiat Studio in the United States. I attended the Fiat Studio opening and was impressed with the beauty and coolness factor of the new digs. It’s a great old historic brick and stucco multi-story building with a display tower visible from the 110 freeway. Not so great was the location on Figueroa near USC. If I don’t work downtown or go to USC, I don’t want to go to this dealer for sales or service. Chrysler ran afoul of California’s dealer franchise laws by owning the store within 10 miles of other Chrysler brand franchises, and last month, it was announced that Motor Village was being sold to New Century Automotive Group, known for its BMW and MINI franchises in North Hollywood adjacent to Universal Studios and its VW dealership in Glendale. 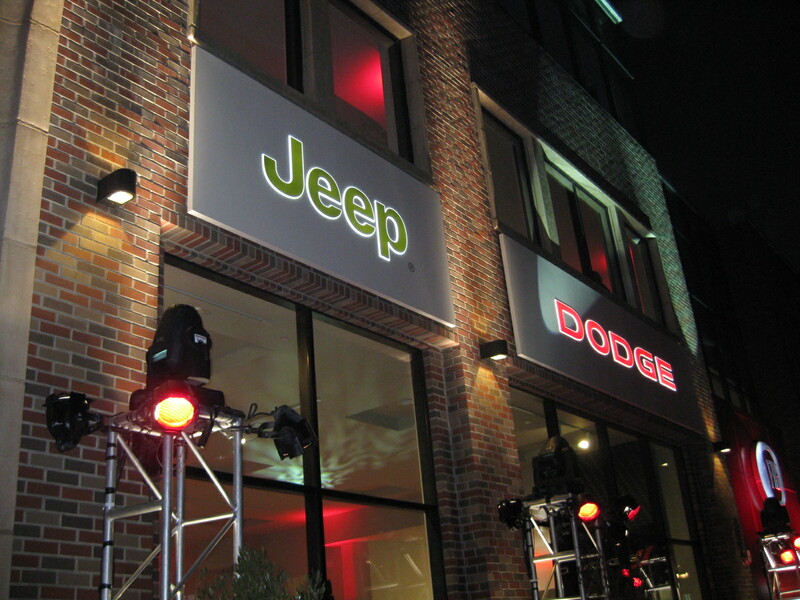 Up until just recently, Motor Village LA was the only Dodge franchise in Metro LA. 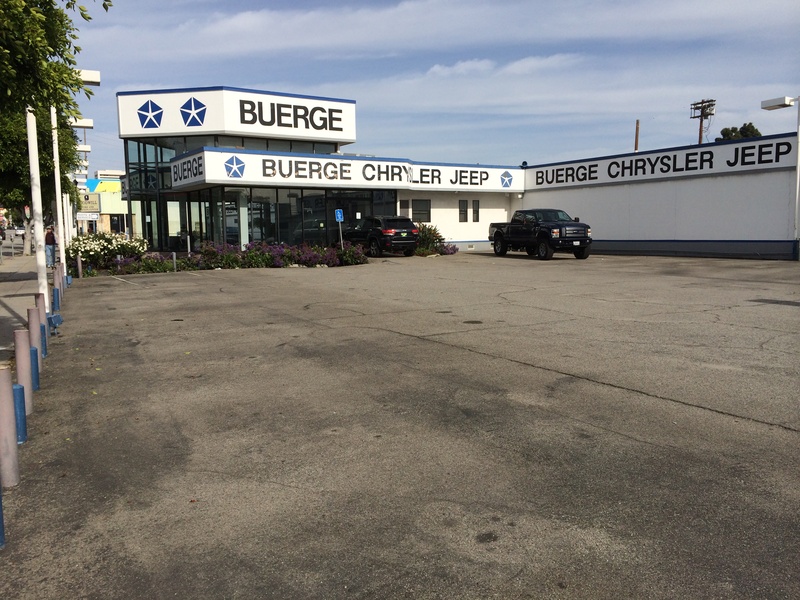 Big Valley Dodge has been replaced by California Superstores Chrysler Dodge Ram Jeep in Van Nuys and Buerge Chrysler Jeep added Dodge and Ram at its West LA location. So we replaced one in the Valley and gained one west of the 405. 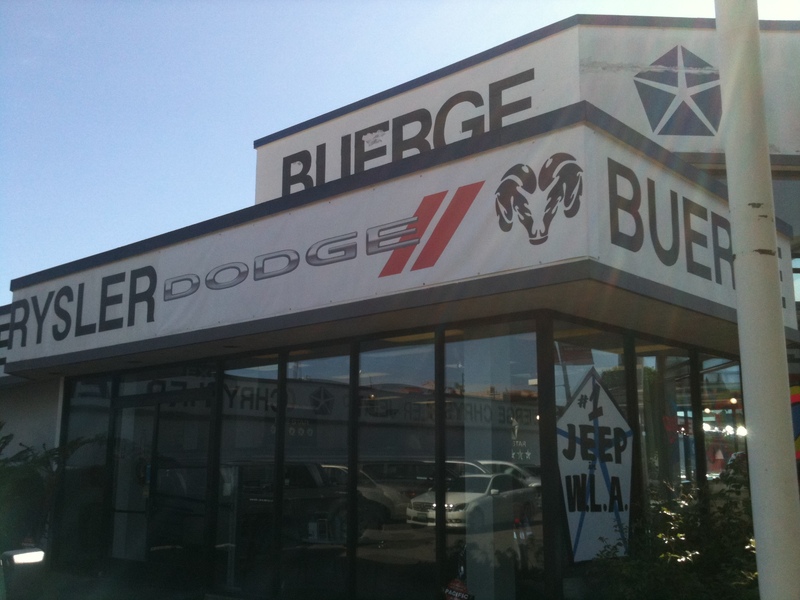 I’ve always wondered how Buerge Chrysler-Jeep (and now Dodge and Ram) survived. 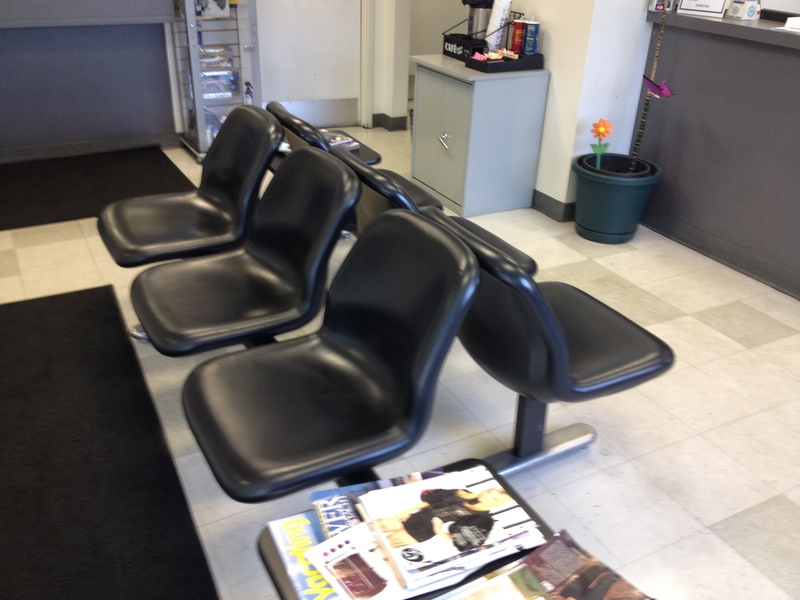 I’ve been there a couple times in the past year and both times business seemed very slow – as in non-existent. Now let’s be clear, I usually go to dealerships on slow days so that the sales staff has time to kill and won’t mind me checking out a car without buying it. But I can generally wander around the lot without being noticed by a salesperson and the showroom is usually empty. 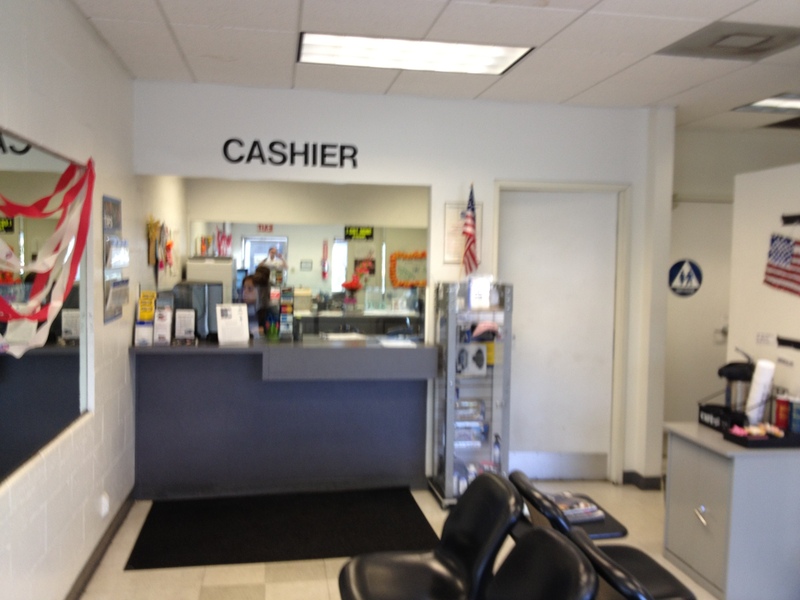 I checked the service bays in back, and there is some service life, but the bays definitely aren’t filled. One time, I went to look at the all-new 2011 Grand Cherokee. It had just come out to great reviews and Buerge had several on the lot. I looked in windows, walked around and kicked some tires. Finally, a salesperson from the Ford dealer trotted across the side street and asked if I had any questions. I said I was there to see the new GC. We chatted a bit, but I wasn’t offered a test drive. He told that Chrysler didn’t have any lease deals, so they were going to be too expensive to buy or lease. Fair enough. I guess I should just take my business to Mercedes or Lexus and shop for lease deals there. I know they have deals and Jeep doesn’t! A few years ago, I went into the same dealer to check out the Chrysler Crossfire convertible. That time, I got a test drive; but the salesman was sort of laissez-faire about the car or selling it. It had so little tech (or quality) for so much money. He thought it was a better deal for me to just buy the Crossfire’s sister, the Mercedes-Benz SLK. At least on the first-generation SLK (Mercedes just introduced the third-generation SLK), you got a retractable hardtop (not a soft top) and decent, if not great, dash controls and mechanicals. How did they stay in business? Buerge Chrysler Jeep Dodge Ram. Time for new signage? This week, I was interested in the addition of the Dodge franchise. The lot still looked the same: Jeep on one side, Chrysler on the other. The only difference was the banner sign that had been up on the building for a few weeks. This was a Monday afternoon, so I expected sales to be slow. I walked through the lot and into the showroom. No one. I then heard some movement in the back, but it wasn’t forward movement. There was a 2011 Chrysler 300 in the showroom, so I hopped in that. Nice place to kill time, but where is the 2012 model? Eventually, a salesman wandered in and spoke to me. He didn’t introduce himself. I told him I was interested in the 2012 Dodge Charger with the 8-speed automatic transmission. He said that they did have a couple dozen Dodge vehicles on the lot, but no 2012 Chargers. He pointed to one Ram truck at the end of the Chrysler lot. Wow. 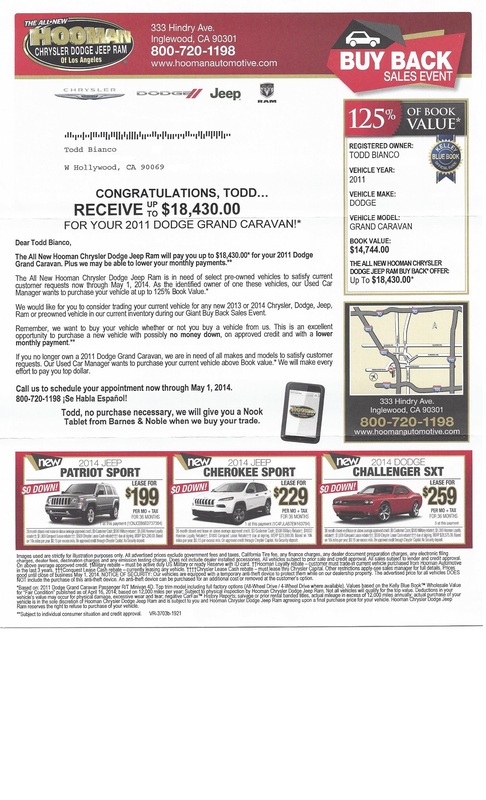 Apparently, the dealer has ordered a bunch of 2012 Chargers and they should arrive in about 3 weeks, if I believe him. He also told me to go online and check the dealer’s inventory. It would show the vehicles in inventory even if they were only in transit. I did. It didn’t. Since he never introduced himself, I didn’t bother to either. No communication = no contact information. I volunteered that I’d come back in a few weeks when they had some inventory and I left. I’m pretty sure he didn’t care if I came back or not. 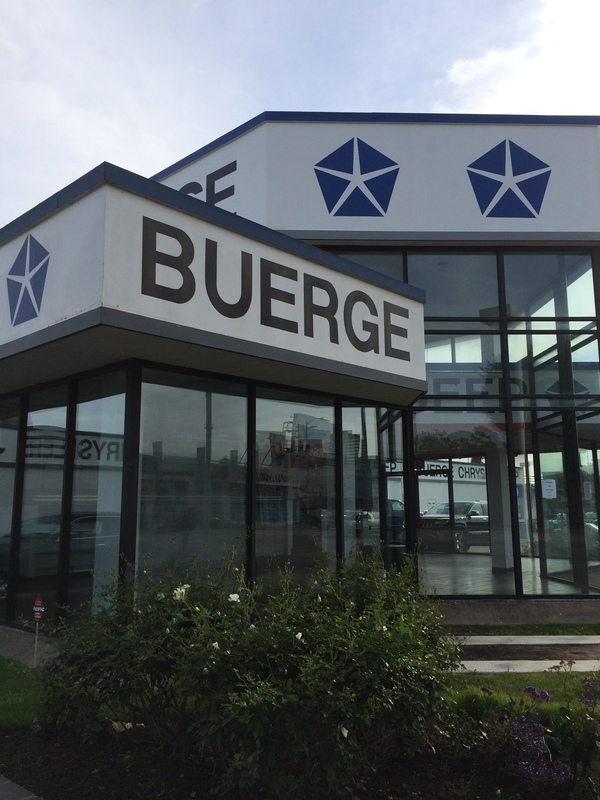 Buerge signage from the west side. I see lots of Jeeps. Where are the Dodges? Don’t waste any time shopping for a car here. Ken from the sales staff will just tell you to buy the car somewhere else. 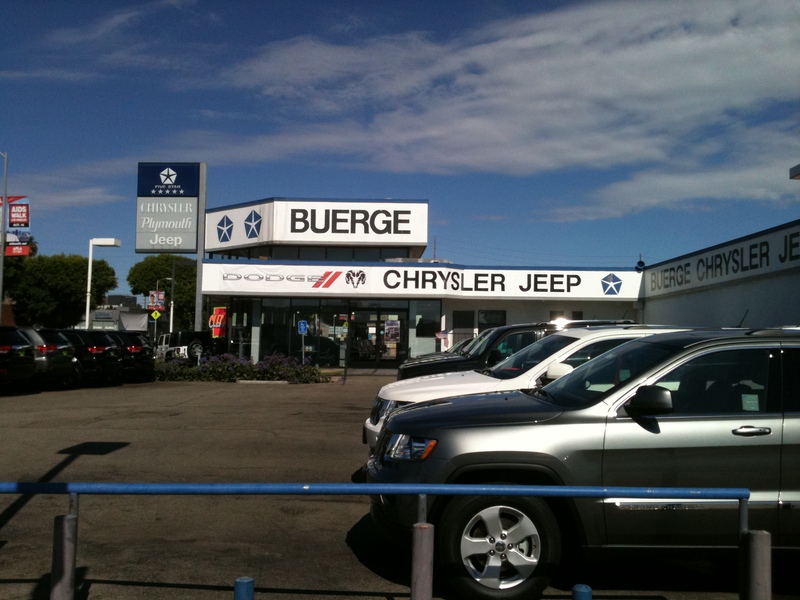 I’m going to go back in a few weeks to Buerge Chrysler Jeep Dodge Ram, now the only Dodge dealer on the West Side, to see if there are any new Chargers. I wonder if I’ll find a responsive salesperson. I doubt it. I have some free advice for auto dealerships: Social media is important. If you don’t have a Facebook or Twitter account, I suggest you do both and engage customers and potential customers in your area. Reach out to the people who have posted negative reviews about your business and see if you can fix it. When I read Yelp, I want to see higher ratings and many more positive comments. Ask existing customers to rate you on Yelp and/or participate with you on Twitter or Facebook. Open a YouTube channel and post videos about your business and its employees. Also post videos from Chrysler corporate and other channels (Car & Driver, Autoweek, etc.) that give great reviews to the products you sell. Personalize the experience for your customers. It’s what you should do and its a good way to burnish your image. Your competition is already doing it and you don’t want to be left behind sucking the tailpipe. Also, when I go to your website (I’m talking to you Buerge), I’m looking for a neat, organized corporate look, but not the dreary obligatory storefront I see. You should also change you name to reflect the addition of Dodge and Ram. I want you invite me to follow you on Twitter or join your Facebook page. Post a video. Add some color. Use pictures from your dealership, not stock photos. If you want customers, just existing in a good location is no longer enough. You have to constantly work on and polish your image. Right now, it’s on life support.